A cup of coffee with Lisa Pozin, Founder/Owner of Giving Gifts? 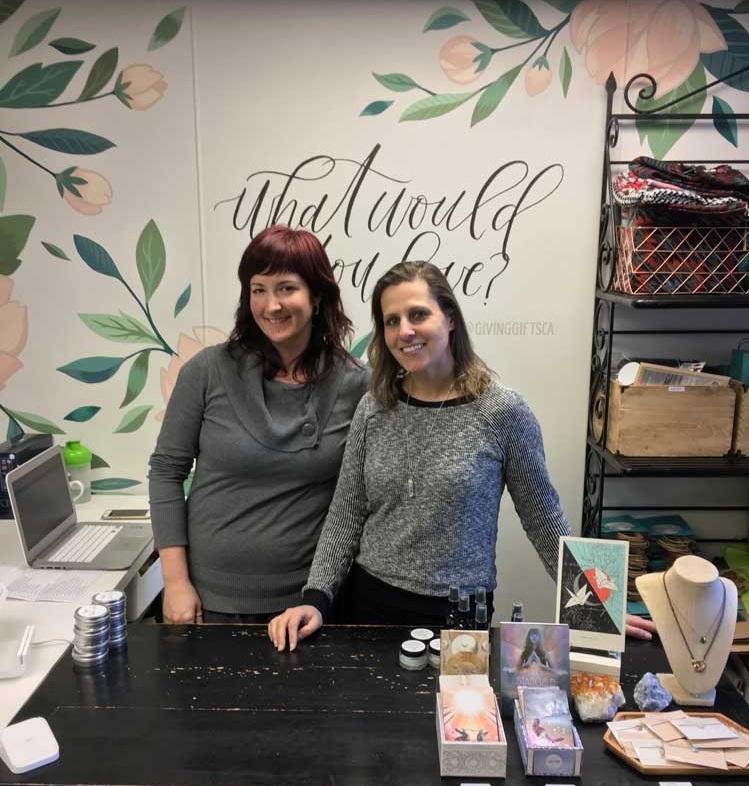 I met up with Lisa at her store located on the edge of Main Street’s retail area close to 30th Ave. With a warm greeting, I was led through the store’s 5 immaculately merchandised rooms, each with their own thoughtful theme. As Lisa described each room she willingly shared some of her favourite items on the shelf, demonstrating her true passion for what she does. The last room we visited before walking down to a cafe to record the interview, was the Skin Care Room with some of the best locally made candles, natural skin care products, soaps, oils and more. “With every item in the store, you can learn the story behind the artist who created them” explained, Lisa. And since the spring of 2013, Giving Gifts has been telling their own story of giving back to the local community and beyond. 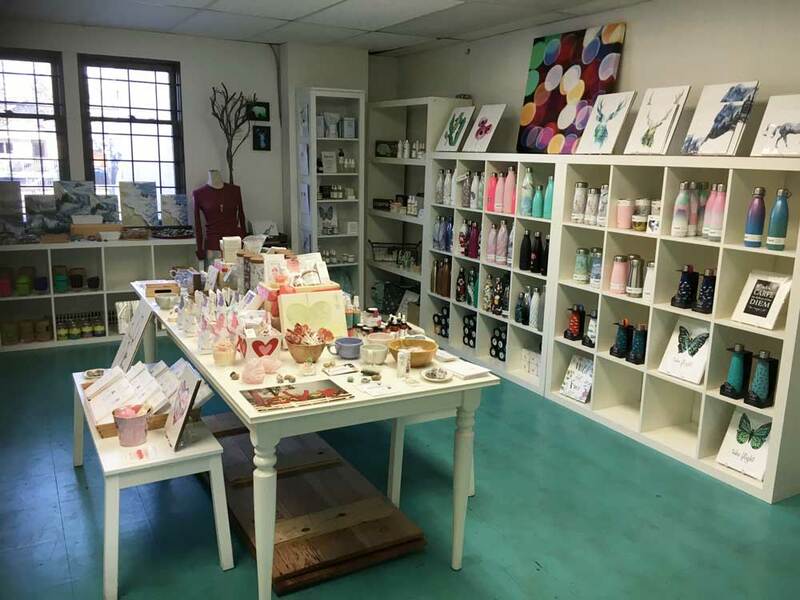 With the beautiful gift boutique being home to more than 100 local artists socially and environmentally responsible gifts, it has become a place that’s all about giving - giving to friends and family, giving to yourself and giving to others around the world. The following is the dialogue between Lisa and me while having coffee at Matchstick Cafe on February 4, 2019. What makes your store Giving Gifts unique? We carry all eco-friendly local artist gifts and fairly made and fair trade gifts. We try to make sure what we are selling we can put our name behind it, stand behind it and feel good about selling it to our customers. We want people to give gifts that they absolutely love. They are beautifully unique, purposeful, well-thought-out items that give back in various ways through respecting the social and environmental impact they cause. It’s not your typical shopping experience because of its unique layout. There are 5 rooms like a mini-mall that you can wonder room to room browsing through all the different gifts. Originally, the store’s space was ridiculous, It was boarded up when I found it. Each room was painted with a different colour and there were sinks in every room. It wasn't made for retail shopping. However, the store has changed a lot over the years. Originally there were 12 of us in the store and each of us took a different area, though I oversaw and organized the whole store. The customers would shop by room depending on what artist they would want to support or product they would want to buy versus having a whole store experience. Your business is what I would call a purpose-driven business, one that operates with clear guidance from your vision and values. Why was it important for you to have started this type of business? I had three kids in three years and on my third maternity leave, I thought I better do something! But prior to that, I remember hearing on the Oprah Winfrey Show, “Buy the change you want to see in the world” and that totally resonated with me. I have always been someone who cared about the environment and was purposeful in how I bought things by being more conscious of the social impact of something I was purchasing rather than the price. That was over 10 years ago and it seems people were just starting to become more aware of the social impact of their purchases. However, there weren’t any retail or online stores that brought everything together yet. That’s when I brainstormed the name and got the website domain. But, it took me a couple of years while on my third maternity leave before I finally decided to do something about it and make every aspect of my vision and dream happen. Giving Gifts started as an online store first. The idea was to bring all these great products with beautiful stories made by brands that were really making a difference in the world all together in one place. Originally Giving Gifts started without featuring local artists but instead, the mandate was to bring in socially responsible, fair trade, and eco-friendly brands that were changing the way things were made and giving back in many ways. On your website it states, “As consumers we make choices with all our purchases, so buy the change you want to see in the world.” Can you expand on the intended message there? I feel we’ve started to see the power of consumerism in that we as consumers have a choice and can speak with our money. The biggest example of that is with organic food. It was very expensive when it was first made available, but there was a demand so grocery stores reacted by creating larger organic sections and dropping prices. Farms have even changed over to be fully organic, making it a priority. People now go out of their way to find and buy organic food. It's a huge movement where we’ve clearly seen as consumers the power in creating change. So similarly, when you are giving a gift, you want to give a beautiful and unique gift that gives back in multiple ways and has a back story that creates all these layers of meaning behind it. I want people to have a really meaningful gift giving experience. Your store focuses on selling eco-friendly products. What are some of the ways the items you sell adhere to that practice? It is mostly about reducing waste, especially when we first started with selling reusable water bottles and coffee cups. If we buy things that are more permanent, we are not having to throw things away as much like a coffee cup every time you go out to have one. It’s little harder with local artists because not all of them are going to have that as their mandate. When we first started we made sure every paper item was made with recycled paper, and mostly purchased from within Canada or through fair trade rather than transporting from all over the world. One of the beautiful benefits of working with local artists is that it reduces environmental degradation and wastage of gas from transporting. Over the years we’ve made other small changes. Our store has nothing that is made from plastic, no plastic toys, nothing with batteries. We have a kid’s room with lots of other toys but nothing made from plastic. Packaging is something people don’t often think about. It’s a one-time use thing that was there to cover up the product, you take it home then discard it right away. Things we carry have very minimal packaging. We’ve started working with some of our local artists trying to minimize the packaging that they are using. Our goal this year is to reduce the plastic sleeves on the greeting cards that we sell. We’ve had 3 artists change over so far to not using plastic sleeves and one is using a corn-based sleeve. One time use plastic is not great for the environment! You work closely with local artists and spend a lot of effort in featuring them in your blog. 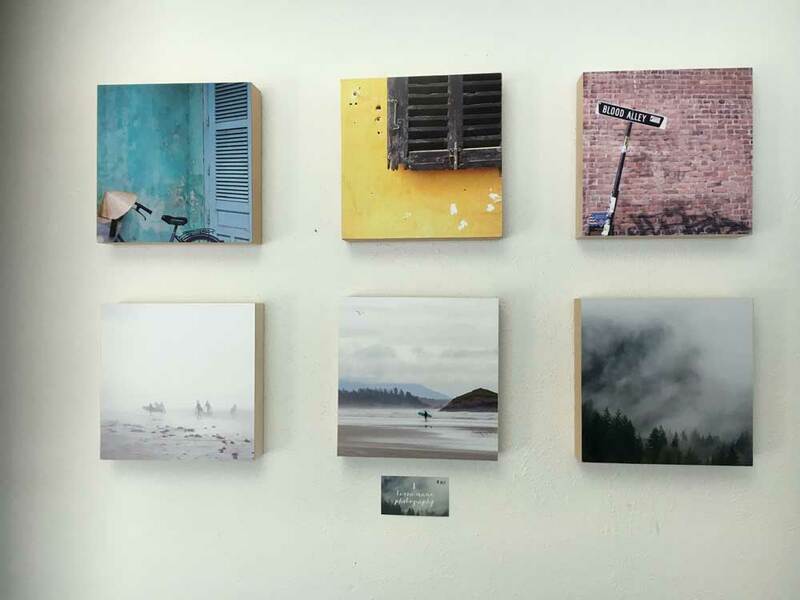 Why was it so important for you to work with local artists? Originally Giving Gifts was environmentally and socially conscious products or anything fair trade or fairly made. Anything made in China cannot be considered fair trade certified, but it can be fairly made, which is a factory that is operated and overseen by an American company and has really clear guidelines on how things are socially responsibly made. After starting the business as an online store out of my house, the business eventually grew enough for me to have a showroom space within a friend’s office where I would book appointments for people to shop or pick up items purchased online. I then started doing a lot of the artisan markets where I could get my products in front of people. The artist community was incredible, I would spend 2-3 days getting to know the people from the other booths around me. So when I opened the retail store, I was able to reach out to all these local artists I knew and bring their items into the store. What are some ways you choose to give back or participate in your community? Every May we do a community campaign that lasts for the entire month. It’s our anniversary month so we like to do something that involves the whole community. Last year we reached out to 30 local businesses in our area and they each contributed a gift towards our campaign, in which we gave away a gift a day from one of the businesses to one lucky shopper. The first year we supported anti-trafficking by donating a dollar for every person that walked into the store. Another year we decided to have a mural painted on the side of our storefront. We had 5 different artists submit their design and people had to vote on which one would end up on the wall. We also did one called 1,000 acts of kindness. Everyone that came into the store that month got to pick a card that had an act of kindness on it they could do for somebody else over the course of the month. We have a really fun one coming up that I’m excited about. These projects create community and help celebrate as a store what we can do to reach out to people and get involved with us in doing something good. We also partner up with local charities over the holiday season. This past year we partnered with BC Women’s Hospital Foundation with every holiday card sold, we donated a dollar. When I started Giving Gifts, this was one of our mandates. It wasn’t only that we were selling brands that had a great story, but it was also that we were going to find ways to give back. Who are your customers? What story do your customers tell themselves when they purchase from you? I hope they are telling themselves that everything they purchase from the store is amazing and that they’re buying good quality, unique and beautiful gifts that they can trust are coming from a place of love and a place that is going to help make our world a bit better for all of us. We want to inspire, touch and move people so that when they come through our store, they leave feeling a little more joyful. For those customers that have not yet considered buying products like yours, what would you want to say to them to help influence their purchase decision? I would tell them that we are a beautiful and inspiring shop to browse and to spend time in reading the artists stories. There are tons of things to touch and hold that are made by beautiful people and beautiful brands that care about and love what they are doing. You will really feel that with the gifts we sell. As a small business owner, what is some advice you’d like to pass on to a budding social entrepreneur? Follow your passion and follow what you love to do because you’ll be spending years and years of doing hard work so you have to have that passion and love behind it. Do what you love, if you absolutely love the idea of it and it really lights you up and makes you joyful when you are thinking about it, be sure to do it, if that’s your calling. I think our dreams are meant to be fulfilled, and if that’s your dream put your heart and soul into it. Work hard, and keep working hard. And then it eventually doesn’t have to be as hard. Keep taking steps every day towards your dream. It doesn’t just happen because you dreamt it. If you had a chance to share one simple message that millions of people would see, what would it be? “What would you love?” We have it written as a mural in our store. It’s like closing your eyes, thinking about what you love and then making that your life. So that every part of your day you are doing things that light you up, get you excited and bring you joy. Where do you want your business to be within the next 2 years? Well, I am excited to see. I would love for more people to know about us. It has been amazing to see how we have continued to grow. We would like to serve more customers and let people know we are a great place to come and shop for gifts. My dream is to see more locations for Giving Gifts. We have a beautiful model that really works and resonates with people. It provides a service to give people that one store where they can go to get inspired to get gifts for anyone all in one place. What are some of the more popular products you sell so those who are unfamiliar with your brand may want to consider them? Natural skin care brands have really caught on where I get calls every day asking if we carry certain natural skin care products, which we do. It is great to see people want the local skin care brands and that they can see the value in them. Are there any upcoming artists that are doing great things that you’d want to mention? I am always excited about K’Pure Naturals, they create an amazing skincare line. How can local artists apply to become a part of Giving Gifts? There is an application on our website, which is the best way. It’s really an easy application process where we ask for your website address, Instagram handle and photos of what you do. We started as 12 people but now have over 100 local artists in the store. We welcome 2-3 new artists sometimes each month. As long as it is a fit for the store or doesn’t overlap with something we already sell. We want to be unique with what we are carrying. Also, I want it to be something I am super excited to share with my customers. If it is something I want to bring into my own home, then it is something I am proud to sell. Well, it depends on the person I am giving it to and the type of gift it is. I am not a book person, where every gift I give is a book, however, there is an amazing book at our store right now that is super heartfelt, beautiful and touching. It’s a collection of poems that Casey-Jo Loos wrote over 4 years called, “I see you. I am you”. It’s a brand new book that would be an incredibly great gift for any one of my friends. I feel like our community and society, in general, are becoming more socially conscious in what we buy. I love the trend of people putting more thought into their purchases and not just looking at the price is a determining factor. I am excited to see what the next few years bring and that people continue to shop with their heart for things that really move them and bring more meaning into their lives. What are the best platforms for people to reach you at? Lisa Pozin is the founder and owner of Giving Gifts. Giving Gifts began as an online store in 2010 with just a few products. It has grown to include a store-front on Main Street featuring more than 100 local artists and fair trade brands from around the world. In 2016, Lisa launched a second e-commerce site - givingcrates.ca, featuring custom curated gift crates and gift boxes. She is proud that both websites celebrate and empower local artists and promote eco-friendly products and fair trade practices. Giving Gifts brings together community and creativity in the spirit of giving.